When we were in our second year of married life our church group was holding a CPR and first aide course. They were trying to get people to become CPR certified. At the time I was so pregnant with our daughter Kayla….like 38 weeks pregnant. Hubby’s parents were part of the group that was sponsoring the course and they really pushed us to go so that there would be enough people and the class would be held. Hubby and I both signed up. I only signed up with the promise that I wouldn’t have to get on the floor and work on the CPR dummies. Once we got to the class Hubby notice that a friend of his was in the same building and was taking a class across the hall. His friend was attending the class for people who were interested in becoming an EMT (Emergency Medical Technician). We attended our class but all the way home Hubby kept saying he was interested in taking the EMT classes. I thought it was a phase but the next day he was calling for more information. The decision was made, he was taking the classes. He put in the many hours of classes it took to be an EMT. Hubby was nervous about the classes. He wasn’t scholarly, to say the least. I told him and told him that I knew he was smart, it was just that he never really cared about what he learning before and I was right. He did fine taking the classes even though he hadn’t done well in school. Even though he could Hubby doesn’t ride in an ambulance. In our rural area he acts as a first responder. Ambulances are 20-30 minutes away and help is needed sooner than that so the first responders are called. They drop whatever they are doing and head off to help however they can. He has been on a wide variety of calls….horrible car accidents, medical calls, abuse calls, choking calls, stroke, heart attack, attempted suicide…in the 29 years of being an EMT, he’s seen a lot. He’s also inspired a lot. Our son Buck has taken EMT classes. Our daughter Kalissa and now her husband Craig are both EMTs and serve the same area that Hubby does. At any given time, they drop everything and off they go. Monday night Craig, Kalissa and Carver were over for supper. 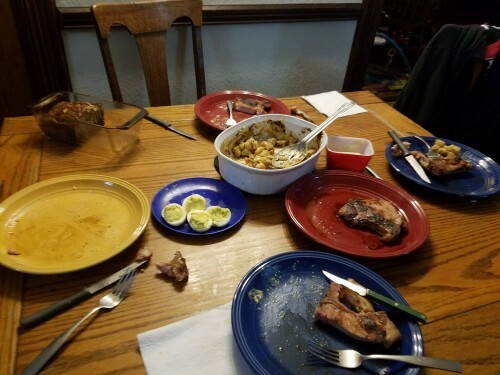 In the middle of the meal of smoked pork chops, potato bake, banana bread and deviled eggs, the pager went off. Kalissa handed Carver to me and off the three of them went. They left the house scrambling for coats as they went. This time they were indoors…this time the call ended poorly. I never know when they leave how they’ll be when they come back. Did they just watch someone die? Did they save a life? Did they see something that they’ll never forget? Did they be a comfort for a family member? Sometimes they are sad. Sometimes they are happy. Sometimes they are very quiet. I don’t know what to expect upon their return. I can see that although they do the work, it can take a tole on them. I am so thankful that they work with a great bunch of first responders. They are awesome and very supportive of each other. For the most part…I don’t worry too much about them while they are gone. They are surrounded by competent coworkers. Carver and I waited for them to return…we rocked. I gave him a bottle. I’m glad I stay back. The fast adrenaline circumstance isn’t for me. I’d rather stay behind scenes taking care of the baby…cleaning the dirty dishes. You can call it fate, or God, or whatever you want to call it, but I know Hubby was meant to take that CPR class all those years ago. Hubby was meant to see his friend in the class across the hall and meant to become an EMT. There are countless times that I know he’s made a difference. Twice, he gave years to the lives of some very important people to me…one time was with his mom…one time was with our daughter Kelli. I’ll have to tell you about those stories sometime. For now, I’ll say this. We almost lost each of them and without Hubby to be there with his medical knowledge, life would have been different as we’d have likely lost them both. I am so thankful that Hubby is a first responder. Sure, left mealtimes aren’t fun but that’s not anything care about in the grand scheme of things. I’m happy he can go and help out as he can. I wouldn’t want it any other way.